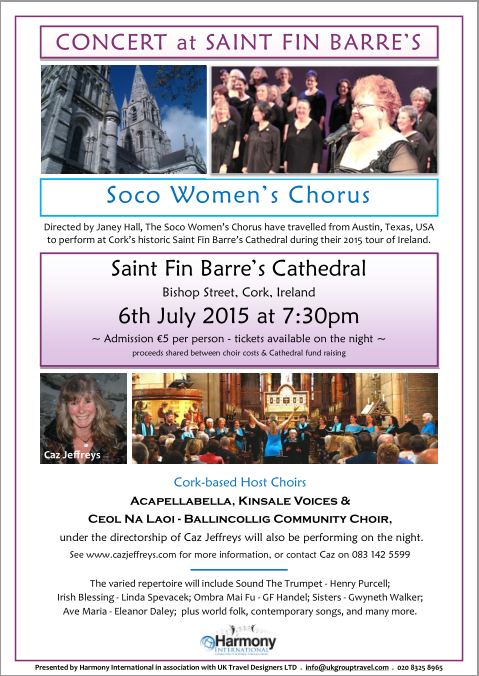 This year all three of my community choirs will be joining together in song with the SoCo Womens Chorus and their musical director Janey Hall who are visiting and touring Ireland this summer. The concert will be taking place on Monday 6th July starting at 7.30pm and all are welcome to come along. There will be a door charge of €5. Hope to see you there! During the afternoon all the choirs will be meeting together to sing, and we are looking forwards to performing some new songs together. < Previous Thank You Body and Soul 2015! !